(CN) – The Louisiana pinesnake, one of the rarest snakes in North America, will receive federal protection as a threatened species after the U.S. Fish and Wildlife Service publishes a final rule this week updating its status under the Endangered Species Act. The snake is nonvenomous and found throughout eastern Texas and western Louisiana. It feeds largely on Baird’s pocket gophers and live in open pine forests with sandy soils. Previously, the snake was listed as threatened under Texas law and classified as imperiled-to-vulnerable in Louisiana, but had no federal protection. Scientists believe the removal of native pine forests in the region has been a major factor in the decline of the snake’s populations. This happened through urban development, logging and agriculture. Other factors include suppression of natural fires and the snake’s fatal tanglings with motor vehicles. Fish and Wildlife responded to public comments in its final rule, including comments from forest industry representatives who argued pine plantations are suitable habitat for the snake. “We sincerely appreciate the efforts of forest landowners to provide habitat for a variety of species and would like to continue working with the forest industry to further explore the benefits of pine plantations,” the agency wrote. The pocket gopher forages on plants that require sufficient sunlight to grow, the agency said. A pine plantation with a closed canopy, therefore, is not a suitable habitat for the snake. 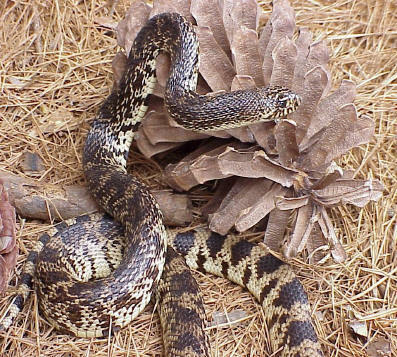 Within the range of the pinesnake, there are multiple extant populations that prevented the agency from assigning endangered species status. There are currently efforts to reintroduce captive snakes into the wild and habitat restoration work is being done by the U.S. Forest Service. “While it is difficult to show an increase in population size with a species that is so difficult to detect, it is reasonable to assume that these populations will benefit from improved habitat management over time,” the agency said.